It makes me nuts when liberals make this a policy that should apply to everyone, but it makes me just as nuts when conservatives make a policy that should not apply to anyone. When they define value in only practical terms and they don’t allow for deviations from a very narrow path. Because if everyone made pants, the world would be a pretty dull place and we wouldn’t change or adapt or make progress. We need impractical dreamers like Lloyd, starving artists and people who live off the grid. We need people who don’t follow the obvious path and who test the boundaries. We need a stable center of people focused on the common good while allowing for deviations so the common good will evolve over time. We need both, one without the other doesn’t work. Look at that. There we are. Blue Eyes and I. On our own. Out of Town. Doing grown-up things like eating at restaurants without kids meals, staying out late and sleeping in, having long, uninterrupted conversations and attending Jon Stewart and Steven Colbert’s Rally to Restore Sanity and/or Fear in Washington D.C. This photo maxes out my zoom lens so you can see, well, not the stage exactly, but the Jumbotron. The stage is beyond that. The Mythbusters guys led the rally in the wave, from the stage to the end of the crowd. We were far from the front, but we were 17 seconds into a 56 second wave. To sum it up in a word, it was patriotic. It was about loving your country and how to love it well by being willing to listen and being kind. (picture of Elephant and Donkey sitting down to tea) Can We Just HAVE tea and TALK? I will pass along advice from Tony Bennett – Please vote on Tuesday. I saw one more funny sign on the plane, not related to the rally. It was outside the airplane bathroom. I didn’t know airlines needed a sign for this and I’m not sure if the people who need the sign are the same people who obey signs, but here it is. I wrote a post recently, Jon Stewart and My Sister, that mentioned, somewhere in there, that conservatives and liberals both make me crazy. 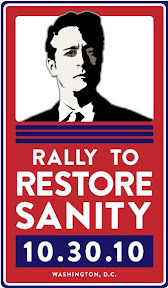 My liberal friends might wonder why liberals make me crazy, so I thought I would write another political post or two, leading up to the Jon Stewart rally this Saturday. As the unique story of one man, this is a fine speech, but some liberals make it a policy of sorts that should apply to everyone and that makes me nuts because while Lloyd Dobler is making this passionate speech, he is wearing pants. Somebody had to make those pants. Someone had to buy the material, design the pattern and operate the sewing machine. Someone had to purchase the pants for the retail store and someone had to ring up the sale when Lloyd came in looking for pants. There is honor in making things that people want, even if what they want is every day and routine. Our country has a huge random collection of the millions of things that people need and it has a huge random collection of the millions of things people can do and it is a beautiful thing when the two meet. That isn’t selling out, that is being a part of the interwoven fabric that keeps us all from running around naked. Some times I hear “corporations are evil” and “I’ll never work for The Man,” but that is like saying you don’t believe in rain. As long as we drive cars and use computers, corporations just ARE and sure, we can improve how they work, but it doesn’t make sense to me to make such broad generalizations or check-out all together.